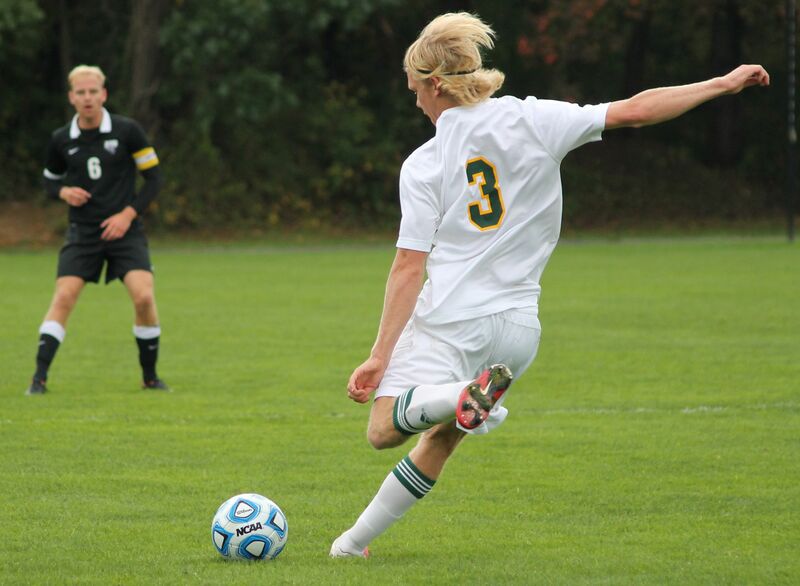 The LIU Post men’s soccer team (8-3-1) returned to action on Wednesday, Oct. 8, when they took on the Wilmington University Wildcats from Newark, Del. The two sides played spectacular defense for the 90 minutes, allowing only seven and three shots on goal respectively. One goal was all that was needed to decide the winner. After a scoreless 30 minutes of action, the Pioneers were awarded a free kick from just outside the box. The shot was deflected by a Wildcat defender and senior forward Eivind Austboe was in the right place at the right time. The leading scorer for the Pioneers added another goal to his stat line, giving the Pioneers a 1-0 lead in the process. The Pioneer defense stood strong throughout the entire match, allowing 14 shots, but only three of which were on target. Junior goalkeeper Jesper Malmstrom kept the opponents out of the net and earned his fifth shutout of the season. The Pioneers returned to Brookville, N.Y., on Saturday, Oct. 11, to play host to the Purple Knights from the University of Bridgeport (4- 5-0). The Green and Gold wasted little time getting going offensively, striking in the 15th minute. The teamwork from graduate midfielder Dale McDonald and junior midfielder Per Forgaard allowed for Austboe to get open in enemy territory and get the Pioneers on the board. The goal gave the Pioneers the early lead, one they didn’t relinquish. Late in the second half, the Pioneers added to their lead with a goal in the 87th minute. With help from graduate midfielder Tom Bowen, junior forward Alfred Lindberg found the back of the net for his first goal of the season. The two-goal lead was more than enough for the Pioneers, as they went on to win by that score. The Pioneer defense stood strong all afternoon, allowing a measly five shots for the entire match, three of which were on target. The visitors from Connecticut never attempted a corner kick and had a hard time getting going offensively. Malmstrom recorded back-to-back shutouts for the second time this season while the Pioneers now own a four-game winning streak, the team’s longest of the season so far. Head Coach Andreas Lindberg and his squad return to action on Saturday, Oct. 18, when they travel to Pennsylvania to do battle with the Rams from Philadelphia University. Kickoff is slated for 2.30 p.m.